Epidaurus sits a few miles off the Saronic coast. 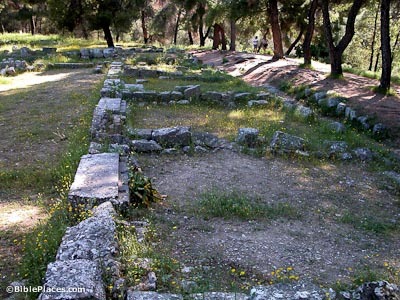 Apollo was worshiped on the site in Geometric times, but with the rise of his son Aesclepius (god of healing and medicine) in the Archaic period, Epidaurus came to be known as the “birthplace” of Aesclepius (ca. 500-475 BC). First thought to be a gymnasium, this banqueting hall had a ramp leading up north to a Doric gateway. It was probably built around 300 BC and was used for ritual meals called thusia. After animals were sacrificed on altars, they would be consumed here. 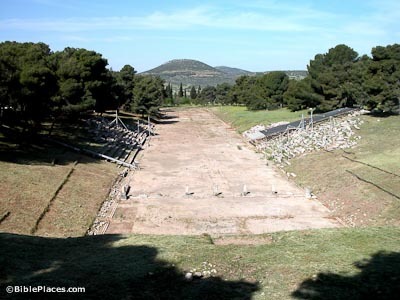 Aesclepius’ athletic and theatrical festival, called the Aesclepieia, was organized at Epidaurus, and many new structures were built on the site in the 4th century BC. Epidaurus was the center of the Epidaurian cult until it was moved to Rome in 293 BC, when the sacred serpent was taken there after epidemic had seized the city. This hotel had four courtyards, each surrounded by 18 rooms. 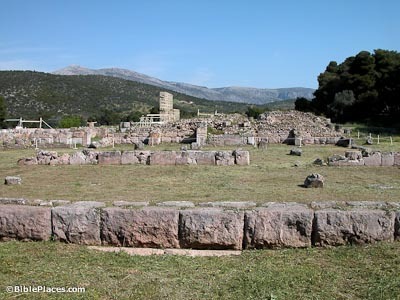 It sits near the sanctuary and thus likely housed more prominent visitors coming for the Aesclepieia festival, similar to the Leonidiaion hotel at Olympia. P. Kavvadias spent much of his life excavating Epidaurus, beginning in 1881. 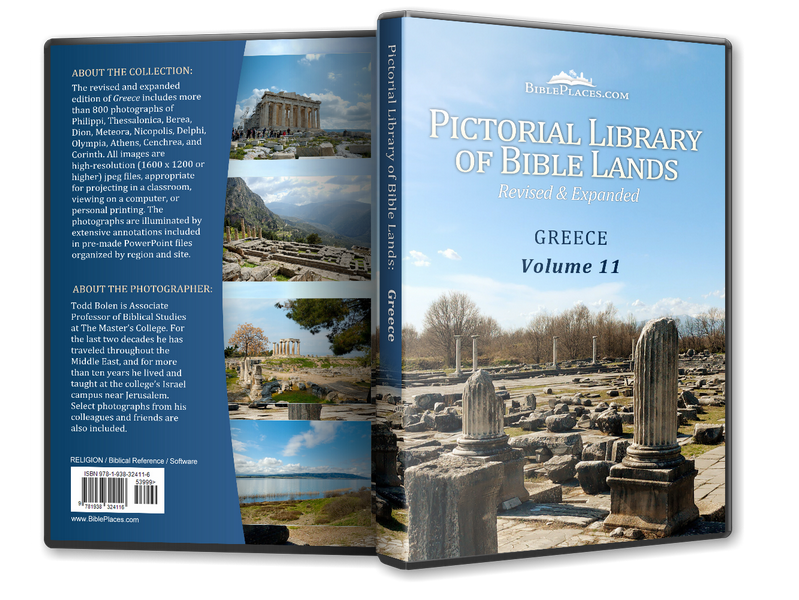 The French School took part early in the 20th century, followed by archaeologists J. Papadhimitriou and V. Lambrinoudhakis. The stadium was built between two small hills, and is 196.44 meters long, 23 m. wide, and has a 181.30 m. long course. There were 22 rows of seats on the north side (right) and 14 rows on the south (left). 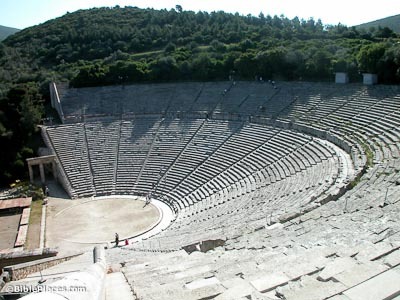 Pausanias noted the beauty and symmetry of the Epidaurus theater, built ca. 330-320 BC. The 55 rows of seats for 13,000-14,000 people still remain, although the stage is not as well-preserved. Reconstruction of the theater began in 1954. The theater is famous for its acoustics: even a whisper on stage can be heard on the last row of seats.